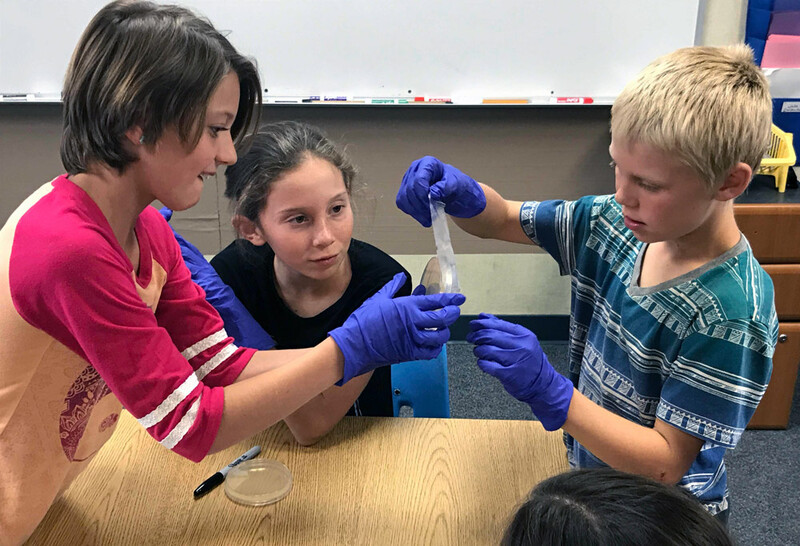 When UC Merced Associate Professor and Sierra Foothill Charter School parent Carolin Frank was working on her grant application to the National Science Foundation (NSF) to study the bacteria in conifer leaves and figure out if they take nitrogen from the air and give it to the tree, she knew she wanted to include a partnership with SFCS in it. “Grants from the NSF include community and educational outreach as part of the criteria,” said Frank, who is also a Founding Member of SFCS and was a member of its board for six years. 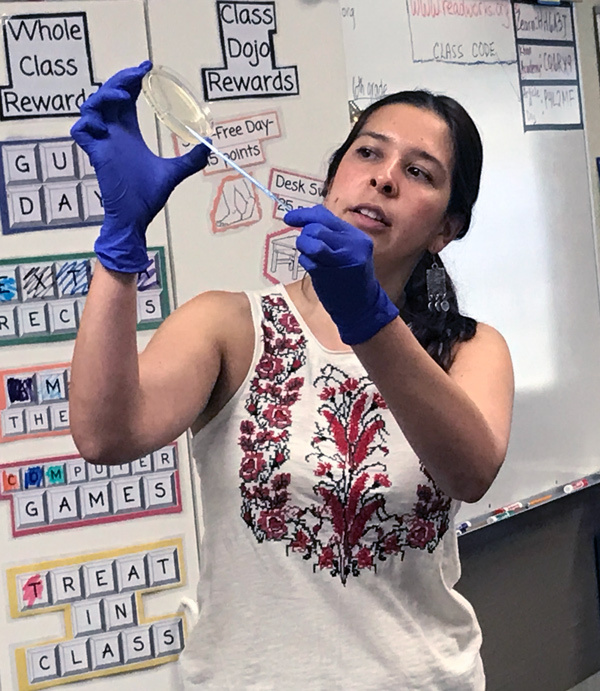 UC Merced Associate Professor Carolin Frank talking to SFCS students about how they will be testing antibacterial soap and regular soap to see which one is most effective in killing bacteria. She is asking students about their hypothesis and what they expect to see. The NSF grant Frank applied for and ultimately received included a Science, Technology, Engineering, and Math (STEM) teacher involvement program. The teacher involvement program supports active, long-term, collaborative partnerships between K-12 teachers and university faculty to enhance scientific STEM knowledge and capacity. Teachers participate in authentic summer research experiences with the scientist. Once Frank found out she had received the grant, when it came to SFCS, the next step was to figure out which teacher and grade levels it made sense to partner with. Part of the lesson was discussing how bacteria is everywhere – and some places more than others, including the inside of everyone’s mouths. As part of the experiment, all students were given assigned tasks. One task was for assigned students to use a special tool to gently scrape one side of their check and then the other, all the same number of times and in the same way. Paola Saldierna, one of Dr. Frank’s grad students, then showed students how to swipe the instrument on the surface of one of their petri dishes to create a control sample that would be compared to samples stirred in various soaps to create samples that would test their hypotheses in the experiment. This past summer, Miranda participated in research together with Frank and Frank’s UC Merced students. Frank’s research deals with the beneficial bacteria found inside the leaves of conifer trees, and the possibility that they may be symbionts (organisms that are very closely associated with another, usually larger, organism) that provide the tree with the essential nutrient nitrogen. Over the summer, the team collected needle samples in Yosemite and processed them in Frank’s lab at UC Merced. Based on these experiences, Miranda has led collaborative curriculum development with Frank and some of her UC Merced students. SFCS students Lily Grauman, Jaeyanna Bolar, and Rhu Jones work together to wrap a protective parafilm stip around a petri dish with a sample in it to keep out contaminants. 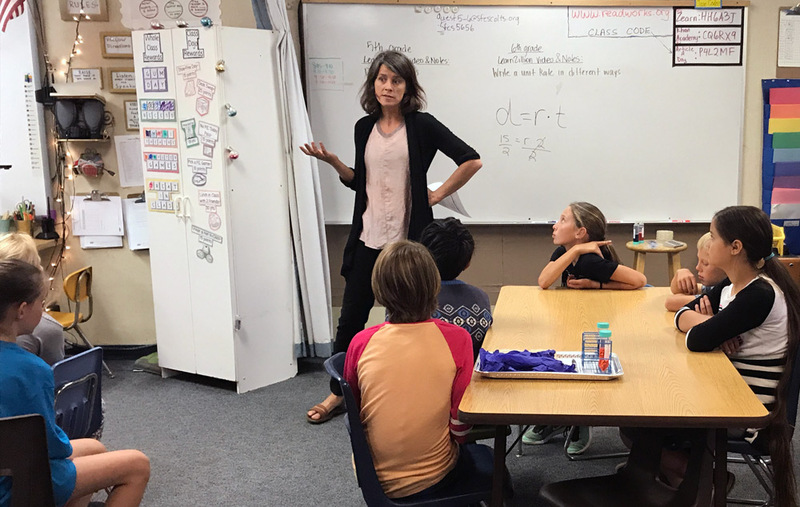 The curriculum is being built into several hands-on lessons taught by Miranda, Frank, and Frank’s UC Merced students in the fifth and sixth grade classroom throughout this school year. The first lessons are happening now and include experiments on whether or not antibacterial soap is more effective in killing bacteria than regular soap. Before an experiment begins, Miranda and Frank talk to students about what they are studying and ask students to formulate hypotheses and predictions. They then take students through the experiments, step-by-step. Students write their hypotheses, predictions, observations, and results in their science notebooks. SFCS students Weston Frazer, Tyler Knauf, Conner Eastwood, and Wyatt Brouillette all have a hand on the experiment. Tyler, second from left, is stirring a tool containing cells from Wyatt’s cheek into one of the soaps the students are testing. Another of this group will be in charge of the next step. Students will get to see a UC Merced lab in the spring when Frank and her students will host them on campus for some activities. 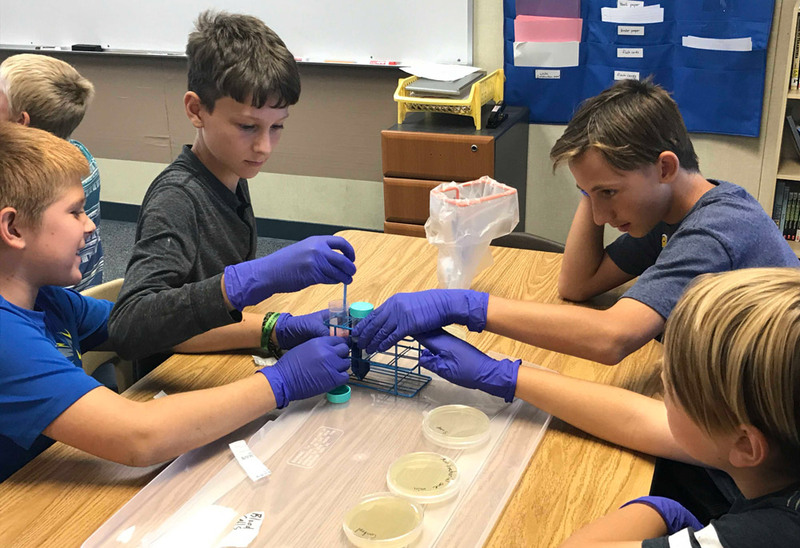 The goal of this collaboration is for fifth and sixth grade students to gain first-hand experience of the concept of scientific inquiry, microbial symbiosis (associations between plants or animals and friendly bacteria), its significance in benefiting plants during climate change, and the overall benefits of bacteria in our bodies and environment. It is a wonderful learning opportunity for all involved. Frank is confident it is the first of many such collaborations between UC Merced scientists and SFCS. 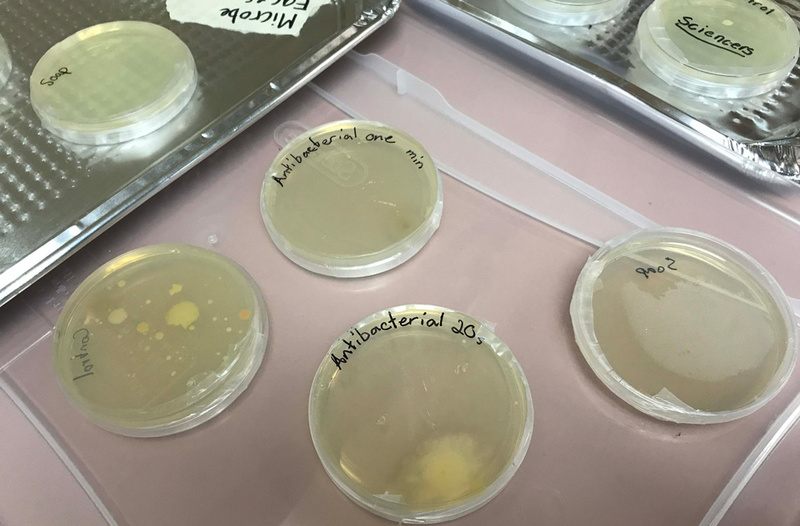 After a few days, students could see bacteria growing inside the petri dishes. Some of the results were surprising. Frank, Miranda, and students talked about the results and the reasons why maybe some things did not turn out as expected and why scientists run the same tests many times to make sure they are getting accurate readings. It’s all part of the learning process. Professor Carolin Frank’s research into the nitrogen-fixing properties of bacteria inside the needles of some high-elevation pine trees is the topic of a new paper in the journal New Phytologist. Frank, with the School of Natural Sciences, won a $1.6 million, four-year grant from the National Science Foundation (NSF) in 2014 for her work on foliar endophytes.“Evidence for Foliar Endophytic Nitrogen Fixation in a Widely Distributed Subalpine Conifer” is the first publication to come from that research. Some old-growth coniferous forests have more nitrogen in their soils and vegetation than can be explained by known sources, Frank and her colleagues explain in the paper. That limits researchers’ ability to understand and predict carbon and nitrogen cycling across about 15 percent of the Earth’s surface. In the past few years, Frank discovered a novel symbiosis between pines and the bacteria inside their needles. She and her collaborators, including UC Merced postdoctoral researcher Andrew Moyes and project scientist Lara Kueppers, demonstrated that the enzyme responsible for fixation of atmospheric nitrogen, called nitrogenase, is active inside the needles. That was a surprise because only bacteria associated with a few forest plants, such as legumes and alders, and free-living bacteria in soil were known to do this. However, Frank and her colleagues still need to figure out which species of bacteria fix the nitrogen, and if they transfer it to the plants. The researchers are using DNA probes in hopes of finding a match and being able to identify the microbes. Frank’s discovery and the subsequent research could help solve an ecological mystery: Where does all the nitrogen in forests come from? The endophytes could be one source. A better understanding of the microbes that fix nitrogen inside non-legume plants could help reduce fertilizer use and improve forecasts about climate change. Frank studies limber pines. The trees are slow growing, but can live 1,000 years or more. They are commonly found from Alberta, Canada, to New Mexico, including eastern California, between 2,800 and 12,500 feet in elevation. She has new undergraduate and graduate students in her lab who are excited to get out into the field and start sampling. “We’re going to work in Yosemite to see if the microbe community changes with the seasons,” Frank said. She’s working with Kueppers and Jennifer Pett-Ridge, researchers with the Sierra Nevada Research Institute and the Lawrence Livermore National Laboratory, respectively. They plan to learn what’s going on with the bacteria at the sub-cellular level through stable-isotope microscopy. One of the fastest growing trees, poplars, may rely on tiny microbes in their leaves to fuel their growth. For more than a decade, a lone researcher has been building a case for nitrogen fixation by bacteria living in poplar leaves. There have been many claims of nitrogen fixation in plants outside nodules where it was known to occur for more than a century. Newly reported experiments involving rice grown on nitrogen-poor soil and poplar cuttings put in air with heavy nitrogen should help convince the skeptics. In addition, another researcher finds evidence of nitrogen fixation in the needles of limber pine and Englemann spruce. If these bacteria prove to be widespread, they could be used to boost crop production on marginal soils. 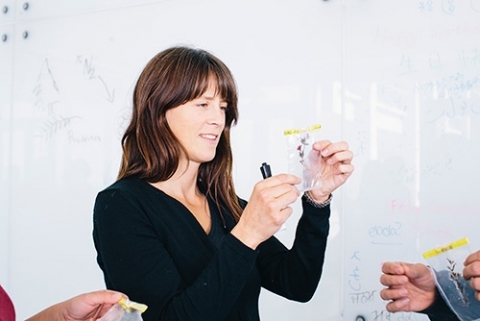 UC Merced Professor Carolin Frank is helping figure out how a certain bacteria helps promote healthy tree growth by studying the bacteria’s genome sequence. In the new paper, published in the open-access journal mBio, Frank and research colleagues in Finland said their discoveries could have practical applications in agriculture and forestry by stimulating plant growth. 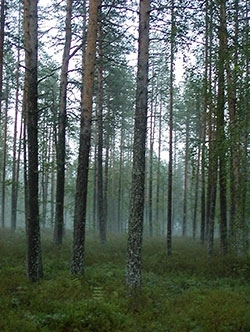 While trying to grow pine tree cells in petri dishes, the Finnish researchers couldn’t get rid of the Methylobacterium extorquens microbe. They were surprised to find the bacterium collecting inside the tree’s cells, especially around the nuclei. And they found that inoculating the pine seedlings with the bacteria made the little trees grow faster, suggesting the bacteria are beneficial. That made Frank want to unveil the mechanisms behind the host-microbe interaction. She and her colleagues were thrown another curveball when they found that some of the bacteria’s genes look more like eukaryotic than bacterial genes. Plants are eukaryotes, and it is possible the bacterium makes these proteins so they can work with the plant’s machinery for protein synthesis, affecting plant growth from within the cells themselves, Frank said. Instead of producing plant hormones like some endophytes do, the microbes seem to transfer growth-supporting proteins into the tree cells’ nuclei. Now that the researchers have found this novel niche for endophytes, they will sequence other bacteria they’ve found in the Scots pine stem cells and study the symbiosis between the trees and their bacteria. The genome sequencing was completed at the Department of Energy’s Joint Genome Institute in Walnut Creek, where UC Merced researchers are forging numerous collaborations. Frank said graduate students can apply to work on summer projects there, as well, giving them a unique opportunity. This isn’t Frank’s first foray into tree endophytes. She works on a bacterial inventory in Colorado and California conifers with fellow Sierra Nevada Research Institute researcher Lara Kueppers. She’s also trying to get a better understanding of the microbes that fix nitrogen inside plants, which could help reduce fertilizer use and improve forecasts about climate change. Frank, a computational biologist, started out researching bacterial pathogens in humans and animals in Sweden, where she’s from. “It’s funny, because Finland and Sweden are covered with conifers, but I didn’t start studying trees until I came here,” Frank said. 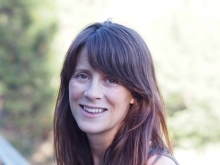 Professor Carolin Frank will collect $1.6 million over the next four years to continue researching the nitrogen-fixing bacteria that live in pine needles and to work with the Sierra Foothill Charter School, which she helped found. The National Science Foundation (NSF) selected Frank, with theSchool of Natural Sciences, and collaborators Lara Kueppers, Jennifer Pett-Ridge and Tanja Woyke at the Department of Energy National labs in Berkeley and Livermore, for its 4-year-old Dimensions of Biodiversity Award, designed to help fill gaps in understanding the many species of plants and animals on Earth. The NSF is distributing $23 million among 12 biodiversity projects this year. Scientists funded by the Dimensions of Biodiversity program integrate genetic, taxonomic and functional approaches in their study and exploration. In contrast to traditional biodiversity research that focuses on one taxonomic group or ecosystem, Dimensions of Biodiversity integrates multiple aspects into research projects. The research will fill in gaps in biodiversity knowledge, Firth said. It also has the potential for significant effects on agriculture, fuel, manufacturing and health. In the past few years, Frank and her graduate student Alyssa Carrell, who defended her Ph.D. this summer, discovered a novel symbiosis between pines and the bacteria inside their needles. Recently, Frank, Kueppers and postdoctoral fellow Andrew Moyes demonstrated that the bacteria, or endophytes, appear to fix atmospheric nitrogen. That’s surprising because until now, only bacteria associated with a few forest plants, such as legumes and alders, and free-living bacteria in soil were known to do this. Nitrogen is critical to plant growth and development, but our understanding of the nitrogen budget is incomplete. Frank’s discovery could help solve an ecological mystery: Where does all the nitrogen in forests come from? “There’s more nitrogen in there than there should be, and these endophytes could be a previously ‘hidden’ source,” Frank said. That could have huge implications for ecosystems and climate. A better understanding of the microbes that fix nitrogen inside plants could help reduce fertilizer use and improve forecasts about climate change. The grant will allow Frank to study the limber pine across its range, from Canada to New Mexico and Colorado to California. A teacher from the charter school will work with the researchers, too, and take what he or she learns back to the classroom. Frank will also help develop some curriculum for grade-school students, focused on environmental microbes. Frank said she appreciates the opportunities the new grant affords. This is her second NSF grant this year. In the spring, she won a $150,000 Early-concept Grant for Exploratory Research (EAGER) award that supports exploratory work in its early stages on untested, but potentially transformative, research ideas or approaches.